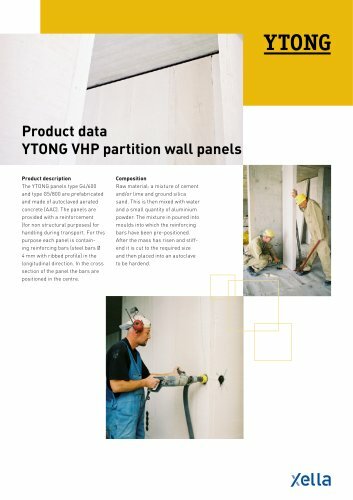 Product data YTONG VHP partition wall panels Product description The YTONG panels type G4/600 and type G5/800 are prefabricated and made of autoclaved aerated concrete (AAC). The panels are provided with a reinforcement (for non structural purposes) for handling during transport. For this purpose each panel is containing reinforcing bars (steel bars Ø 4 mm with ribbed profile) in the longitudinal direction. In the cross section of the panel the bars are positioned in the centre. Composition Raw material: a mixture of cement and/or lime and ground silica sand. This is then mixed with water and a small quantity of aluminium powder. The mixture in poured into moulds into which the reinforcing bars have been pre-positioned. A ­ fter the mass has risen and stiffend it is cut to the required size and then placed into an autoclave to be hardend.